That virtual cat you’re raising online? It may finally be worth something. Developers of games such as CryptoKitties are embracing blockchain, the database technology behind bitcoin and other digital coins, spotlighting legal questions about whether in-game rewards and characters that are bought and traded online amount to gambling activity. Gamers and game developers including Machine Zone Inc. have sparred over whether virtual game items, anything from cats to swords to cloaks, are “things of value” for purposes of gambling laws. Courts have been grappling with how to answer that question even before the gaming industry began using blockchain technology. The digital ledger system amps up the argument that such items do have value. With other games a sword may only exist within the four corners of the screen, but blockchain enables players to own and trade those items long after the game is gone, Ari Scharg, a partner at Edelson PC and co-chair of the Illinois Blockchain and Distributed Ledgers Task Force, told Bloomberg Law. “With blockchain the concept of ownership changes,” Scharg said. Game makers using blockchain will need to be careful about their product design or possibly face litigation. The fast-developing technology could lead such games to be considered online gambling, which is illegal in many states. Increased liability could stifle the gaming industry’s growth. 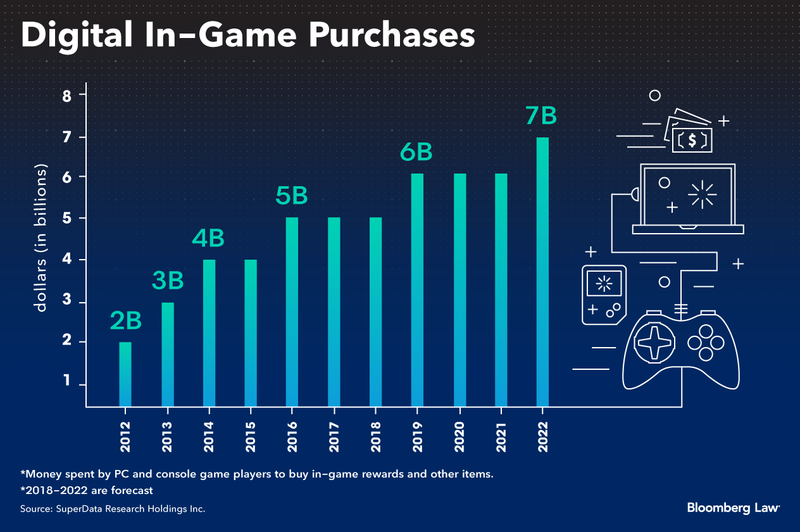 In-game spending by computer and console game players are estimated to increase to $7 billion in 2022 from $5 billion in 2017, according to SuperData Research Holdings Inc., a gaming market research firm. Gambling laws vary from state to state. Offline or online games where players pay for the chance to win a thing of value generally are considered gambling, subject to individual state interpretations. Courts have held that games that give out virtual prizes aren’t gambling under state laws because the prizes don’t have value, even if they are sold on other platforms such as eBay Inc. or digital distribution platform Steam. But trading virtual game items on a blockchain places real value on those items, and could convince courts that they do satisfy the prize element of gambling, attorneys say. “To the extent the market places a value on virtual items, playing a game where those items are staked or awarded could make that game play gambling,” Frank A. DiGiacomo, a partner at Duane Morris LLP in N.J. whose practice focuses on gaming law, told Bloomberg Law. Players of CryptoKitties, the first major blockchain-based game that was created in November 2017, have sold more than 200,000 unique digital cats using digital currency called ether, Bryce Bladon, communications director for Axiom Zen, the game’s creator, said. Gaming website platform Enjin has developed a digital currency called Enjin Coin, which game developers can use to create their in-game items. Players will then be able to buy and sell those items on Enjin’s blockchain-based online market when it launches, Enjin Chief Technology Officer Witek Radomski said. The massive computer power required to use a blockchain may itself demonstrate that a virtual item on a blockchain has value. “There’s good evidence that it must be valuable because someone just devoted 14 kilowatts of electricity to process a ledger transaction,” Marc Whipple, a gaming law attorney at Crawford Intellectual Property Law LLC, said. Video game makers have been drawing broader legal scrutiny as to whether users of their products are gambling. The legal issues aren’t settled, even as gaming technology becomes more sophisticated. Developers of strategy video games including Machine Zone’s Game of War and Sky Union LLC’s Castle Clash have escaped lawsuits alleging that the elements of chance in their games amounted to unlawful gambling. The plaintiff in the Sky Union case, for example, alleged that players can buy virtual gems for the chance to win a rare character. One appellate and three district courts have ruled in these lawsuits that the in-game items at issue weren’t things of value under gambling statutes, Bloomberg Law data show. The U.S. Court of Appeals for the Fourth Circuit said in Mason v. Machine Zone Inc. that virtual gold in Game of War had no value because it couldn’t be redeemed for money. The U.S. District Court for the Northern District of Illinois said in Soto v. Sky Union LLC that virtual heroes in Castle Clash lacked measurable value. Such games should already be considered gambling because they involve something of value, Ryan Morrison, a gaming law attorney and founding partner at Morrison Lee in New York, said. “With a little more research, a better presentation, and a judge who knows more about technology, it’s really hard to argue there’s not value here,” he said. Game developers need to be mindful of gambling laws when developing blockchain-based games, DiGiacomo said. There are precautionary steps they can take to head off potential gambling claims, attorneys said. Developers of games with an element of chance should expressly prohibit, in their terms of service, exchanges of their gaming items for real-world money, said David Hoppe, a video game attorney and principal of Gamma Law, a practice group within Access International Law Group PC in San Francisco. Companies should take reasonable technological steps to prevent secondary markets from developing and terminate user accounts they determine to have violated the terms, he said. CryptoKitties worked with lawyers and regulatory commissions to ensure it was “working within the boundaries and spirit of the law,” Bladon said. Part of “being a leader in any emerging space is recognizing your responsibility for how the future of this space is shaped,” he said.